ingle page Trial balance sheet on pale blue lightly lined paper stock, 5.25" x 16," with header of "Trial Balance (pages 22 to 30) July 2/57." The P.E.F. known as the Perpetual Emigration Fund, started in 1849 with the goal to assist with mass emigration of The Latter Day Saints to Utah on what would equate to relatively little financial resources to do so. Neatly penned accounting ledger inclusive of the head office ("T Office" (Tithing office) ) names of individuals including Brigham Young as "B. 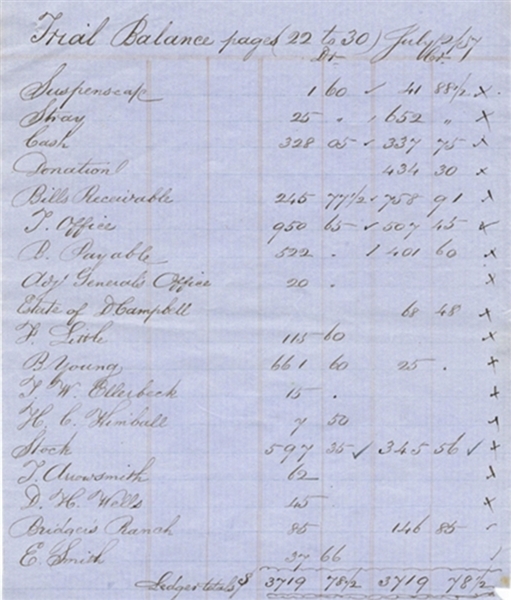 Young," "D.H. Wells," E. Smith," names of possessions and tangible items ("stock,") common accounting buckets of "Donations," "Bill Payable" and "Bills Receivable," "Cash," and a credit from the "Estate of D. Campbell." But perhaps the most intriguing was the debt to "Bridger's Ranch," which has an intriguing history with the emigrating Mormons (see below). Verso of page blank. Page very lightly toned with a touch of nicking along top edge. Expected folds, else near fine. Companion to controversy wherever it appeared in the early days, The Church of Jesus Christ of Latter-day Saints nevertheless grew at a phenomenal rate. Hundreds of converts were baptized each month in 1850s England and Wales. But Brigham Young's Zion—and the new proselytes' surest refuge—was in America. As noted by Arthur King Peters in his Seven Trails West, "the Mormon Trail of those years stretched all the way from Liverpool to Salt Lake City, making it by far the longest of any trail west."